Pound End01263 715779work01603 870304fax Self-cateringAttached to the owners' property, Pound End is set on a working dairy farm and guests benefit from use of the heated indoor swimming pool during the day in summer months. In a mid Norfolk location, it is perfectly placed for exploring all that this beautiful county has to offer, from undulating countryside to market towns and villages, the historic city of Norwich and the stunning coastline. Attached to the owners' property, Pound End is set on a working dairy farm and guests benefit from use of the heated indoor swimming pool during the day in summer months. 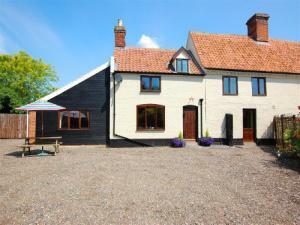 In a mid Norfolk location, it is perfectly placed for exploring all that this beautiful county has to offer, from undulating countryside to market towns and villages, the historic city of Norwich and the stunning coastline.